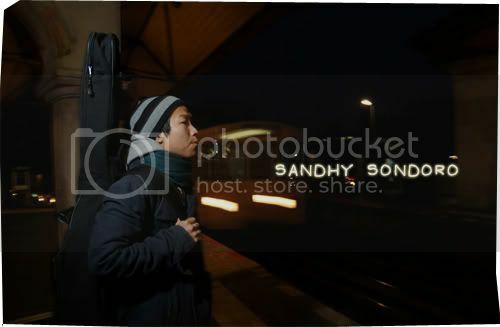 Today’s post came through a recommendation from my cousin: Sandhy Sondoro is an Indonesian singer/songwriter, who currently resides in the wonderful city of Berlin, Germany. The music of Sandhy Sondoro is in essence, immaculately crafted songs that are enfolded by the structures of soul pop music. Songs contained in his latest debut, Why Don’t We, sounds no different to the generic mainstream pop that’s often getting the spin on commercial radios, but this particular live acoustic performance does have an exception for being especially excellent. Stripped off from all the glossy production, is when his talent really shines through; the music is easygoing and heartfelt, immediately captured in the warm tones, with a dripping glaze of smooth, rich, deep vocals. Do note that the performance will only take place after the first minute from the start of the video. Unfortunately, I couldn’t find any mp3s, though if you’re interested, his record is already out now and is available through iTunes. Personally, I don’t find Sandhy’s music favourable to my taste, but it doesn’t take a fan to music such as these to realize the outpouring talent coming from this 34 year old.